It happens to everyone. No matter what kind of art you make or how many years you’ve been doing it, some days you just get stuck. You hit a creative wall in the piece you’re working on, and you have no idea what to do next. Or you’re trying to start a new project and the “blank page effect” is stifling your artistic mojo. • Get up and move. Art is a full-body activity and you have to get out of your head once in a while. I like to put on music and dance, but maybe you’re more of a downward-dog or jumping-jacks kind of person. And if you’re engaging in some kind of seated project like a drawing, try working standing up instead. • Copy someone else’s work. (Despite what you may have learned in elementary school, you will not be punished for this.) When you have no idea where to begin, try borrowing another artist’s image or style to use as a jumping-off point. 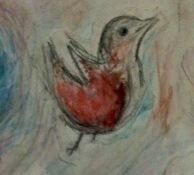 I created the bird featured in this post, made with oil pastels on paper, as part of a larger drawing compiled with images from Marc Chagall’s paintings. This process, which I finished in one afternoon, helped me break out of a rut when I was stuck on another project. • Try out unfamiliar materials, or use your favorite art material in a new way. If you usually draw with colored pencils, try Sharpies. If pen and ink drawings are your thing, try using ink with a sumi brush or even a piece of string. Experiment with a different surface—brown kraft paper instead of white sketch paper; plywood instead of canvas. You might surprise yourself with a new insight into what to do next. Whenever I switch materials like this, my left brain gets bored or confused and wanders away, leaving my right brain in charge… always with interesting results. • Switch gears. I like to have several projects going at once, so that I can gravitate to the one that feels right on a given day—and so that I can move to a different project if I get stuck on the first one. Keep in mind that these projects can be in very different stages. Maybe on a day when you can’t get into flow with a nearly finished painting, you can stretch a canvas or two to prepare for new ones. • Ask for feedback. Ask the artwork what it needs. Have a little dialogue with it (aloud or on paper) and see what comes up. Or, invite a trusted friend into your creative space and ask him or her for an opinion on where the piece needs to go next. You don’t have to follow your friend’s suggestion, but the act of discussing the work might lead you to a new experience with it. • Get some distance. Step away from the artwork. If it’s two-dimensional, put it up on the wall; otherwise, get a new vantage point several feet away. Switch out of detail mode and into big-picture mind. • Walk away. Leave your creative space for an hour, or a day, or a week. When you come back, you’ll see the work with fresh eyes and have a gut response about what to do next. This tactic works great for “can’t get started” days, too: You’re empty, so go fill up the creative tank with a walk, a book or movie, a road trip, or whatever. Live a little. That life will infuse your artwork when you return. Need an infusion of creative experience? Sign up for an art workshop at our studio! Check out the newest listings here.